Ground Floor: Open plan ultra modern white kitchen which is fully equipped and incorporates a dining area with table and seating for 8. 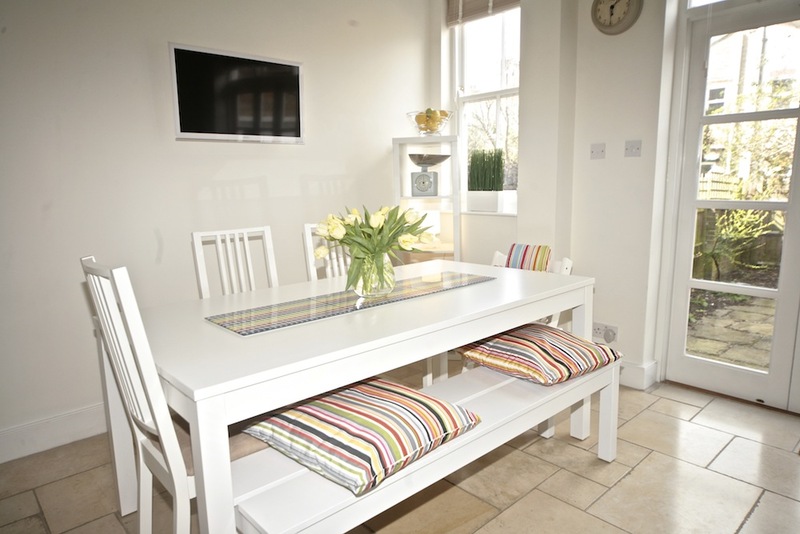 A lovely glass conservatory with comfortable sofa’s and chairs and TV is located off of the kitchen. A newly refurbished small lounge room with grey sofa and TV can easily convert to become the 5th bedroom. This room has two sets of French doors leading to the rear garden and patio.A guest w/c is also located on this ground floor. Dark wood floors throughout. First Floor: Large neutrally decorated master bedroom with lots of storage and a superking size bed and small 20 inch TV. Two further 3foot wide single bedrooms and a shared family bathroom offering bath, overhead power shower, w/c and basin complete this floor. Second Floor: The entire space is taken up with a large spacious guest bedroom with superking size bed. There are spaces that do show some of the sloping eaves but it is a good space with a lovely large modern en-suite bathroom with separate bath, walk in power shower, w/c and basin. This home is very nicely presented throughout and neurtrally decorated. Is both non smoking, pet free and has good wifi. Off street parking for two cars.